Could ESPN Be Any More Obvious? ~ The Bucky Channel - The World of Sports from Wisconsin's Perspective. Home » Chicago Cubs , ESPN , idiots » Could ESPN Be Any More Obvious? Nearly every one of their anaylsts pick the Cubs to win the World Series this year. Cubs highlights are one of the first games showed on Baseball Tonight and Sportscenter night after night. And they are really playing up this 100 years since a title thing. Well, just went you thought ESPN's hard-on for the Cubs couldn't get any bigger, this appears on the front page of ESPN.com. What the hell is this? Are you telling me the biggest story in sports on June 20th, 2008 is why to jump on the bandwagon of the Chicago Cubs? 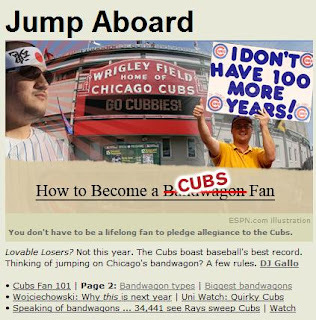 A Wojciechowski article, a Uni Watch write-up, and article on how to be a Cubs fan, and highlights from their game, even though they just got swept? That's another thing, the Cubs just got swept! By the Rays! Instead of putting a cover story on how the Rays are playing better than ever before, they try to cover up the sweep by telling us how great being a Cubs fan is. A little propaganda going on here, if you ask me. Man, I hate the Cubs. My love for ESPN has much to do with their virtual omnipresence. They are the Microsoft of sports journalism, so it's hard not to include them in my everyday life. ESPN does put on the ho heels for the hot topic player or team. It doesn't help that the Cubs play in one of the biggest media markets in the country. They'll be media darlings so long as they're not totally embarrassing themselves. Just remember thought that when the Brewers were 24-10, Baseball Tonight & Sportscenter were giving them a TON OF LOVE. Though ESPN gives East coast, West Coast, & other big market teams the benefit of the doubt (to a fault), they'll also latch onto anyone who's winning. So if teams like Milwaukee & Tampa keep winning (baby! ), all will be well with the world. Maybe one of the ESPN staffers has a sardonic sense of humor ... the overzealous coverage of the Cubs on their web site right after they got swept. It was probably something they had scheduled a few weeks in advance & the Cubs just happened to make themselves look like idiots by getting swept. The Cubs were the last team in the MLB to lose three in a row. Hopefully that trend continues. Hate to admit it, but there are a lot of bandwagon jumpers in wisconsin in regards to the brewers now days. I hate the Cubs too! Don't look now, but another CUBS HEADLINE on ESPN! Well if it makes you feel any better "Big Z" is going to miss at least one start and by the way it sounds probably more. Injuries are piling up in the NL Central, Wainright, Pujols, and now Zambrano. Time to make up some ground.